I returned home from my longest road trip yet. It was fantastic, uplifting and exhausting. Over the course of 11 days, I attended four events, each one progressively larger. On Wednesday, October 3, we hosted a client meeting in Nashville, Tennessee with most of our Young & Free partners and Spokesters. The location – Cellar One – was a really cool event space that we found through a random Google search. The format was a BarCamp, where the agenda is built on the day of the event by all of the attendees. It's a little nerve racking to not have a set agenda going into a day like this, but it's also really liberating to just go for it. As it turns out, we discussed the right things and everyone went away with practical information and lots of great ideas. We are in a really unique position with all of our clients working toward the same goal using the same overall strategy. The collective knowledge that this group has and the open sharing that took place was awesome. For the third annual Symposium, held on October 4 and 5, we decided to move it from the FORUM Conference & Events Center in Fishers, Indiana to the Frist Center for Visual Arts in Nashville, Tennessee. It was a risky move considering that we had a beautiful event space in Fishers, but it was time to shake things up. I was really pleased with the event and feel that it was the best Symposium yet. I wrote a wrap-up post on the CU Water Cooler site and for really in-depth coverage, check out the great 12-page report on the Credit Union Times website that Myriam DiGiovanni just published! The Young & Free Jam World Tour continued and the Symposium attendees did not disappoint. Event number three was Imagine 2012, a conference on cooperative economics. It was held in Quebec City from October 6 to 8 and it included very heavy material with a truly international perspective. It was interesting to pull back from the credit union industry and see how the entire cooperative ecosystem fits together. I was attending with my credit union director hat on and I appreciated the success stories mixed with the global challenges facing the broader cooperative movement. The final event on my whirlwind tour was the mega International Summit of Cooperatives held in Quebec City from October 9 to 11. There were 2,900 attendees from 91 countries representing every conceivable type of cooperative. The content and speakers were first class and the pure scope and scale was awesome. 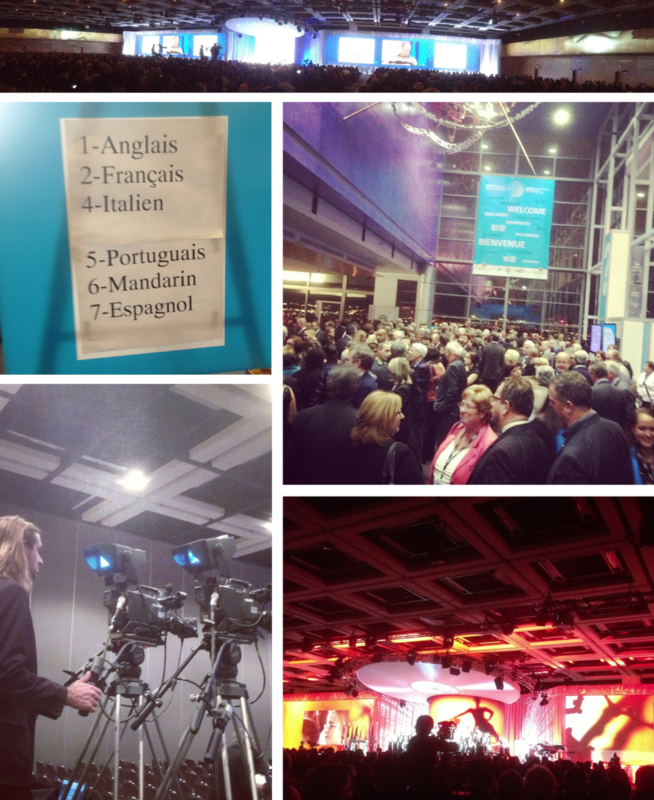 Desjardins was the primary event organizer and it was a clinical demonstration in expert event planning and execution. The technology was unbelievable – in fact, I've never seen anything like it. Dozens of high-definition broadcast cameras, a 200-foot screen in the main hall, constant beautiful abstract animations on screen and every speaker translated in six languages in real-time to name just a few of the technical feats that went off without a hitch. It was a 10 out of 10 and the location at the edge of Old Quebec City was spectacular. The gala entertainment was a preview performance from Cirque du Soleil's latest show. The whole experience was hard to comprehend when contrasted with the typical credit union events that I attend. Amidst all of the spectacle, the overall theme of "The Amazing Power of Cooperatives" shined through. Economists, academics, analysts and cooperative leaders shared success stories and challenges. It was a great way to celebrate the International Year of the Cooperatives. I was a guest panelist at the Future Cooperative Leaders Program at the Summit. I had the pleasure of sharing the Young & Free success story. Near the end of the session, a young woman from Israel got up and shared her story that nearly made me fall over. She said that after searching the Internet for information on cooperative banking, she stumbled upon Young & Free and was fascinated by all of the videos and content. She was so inspired by her discovery that she is now right in the middle of founding the first credit union in Israel! This was a humbling and gratifying moment for me. And of course, I wasn't about to let this opportunity to get all of the international cooperative young leaders dancing slip by! Oct 12 What Do You Say To Taking Chances?